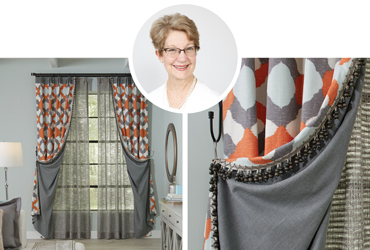 Follow along as Donna Cash fabricates intricate pleated-to-pattern panels with contrast banding and beaded trim. From our Metropolitan Comfort Living Roomscape, our drapery treatment also features a second loosely woven sheer layer with a Euro relaxed pleat. Both panels are installed on AriA® 1 1/8” diameter H-Rail Traverse Hardware in Matte Black finish with the stacked cube mix-and-match finial from our new Atelier collection. Register now to attend this free webinar! What memberships do you belong to? What is your company's annual purchase of materials?